I always seem to forget about polenta. It’s not something I do on purpose, it’s just not a dish that I think of very often to make and then I realize just how versatile and great-tasting it can be. Sean was just saying to me the other day that we had not had polenta in a long time and he was right. I couldn’t even remember the last I made it and we always have some around the house to make. Polenta, much like it is with rice, oatmeal, grits and the like, is so great because you can add lots of things to it to bring out even greater flavors. That’s what I really liked about this particular recipe from the New York Times for butter nut squash polenta with sausage and onion. It makes great use of one of my favorite fall vegetables by incorporating it into the creamy polenta, adding another great layer of flavor and texture to the polenta itself. In a large pot set over medium-high heat, combine 4 1/2 cups of water, the kosher salt and the bay leaf. Bring the water to a boil and then slowly whisk in the polenta. Stir in the butternut squash to the polenta. Reduce the heat to medium-low and simmer, stirring frequently, until the polenta and the squash are very tender, about 20 to 30 minutes. If the mixture is getting too thick while cooking, add a little bit more water to the pot to thin it out. Stir in the butter and the black pepper. Taste the polenta and adjust the seasoning with salt and pepper if it is needed. While the polenta cooks, heat 1 tablespoon of the olive oil in a large skillet set over medium-high heat. Add the Italian sausage, the rosemary and the fennel seeds (if using). Cook, stirring occasionally, until the sausage is golden and cooked through, about 7 to 10 minutes. You can cook the sausages in batches if necessary, adding more olive oil to the pan if the pan looks dry. Transfer the sausages to a paper towel-lined plate to drain. Add more olive oil to the skillet if it looks dry and then add the onions. Cook, stirring occasionally, until the onions are tender and golden, about 10 to 15 minutes. Return the sausage to the pan and stir it together with the onions to heat the sausage through. 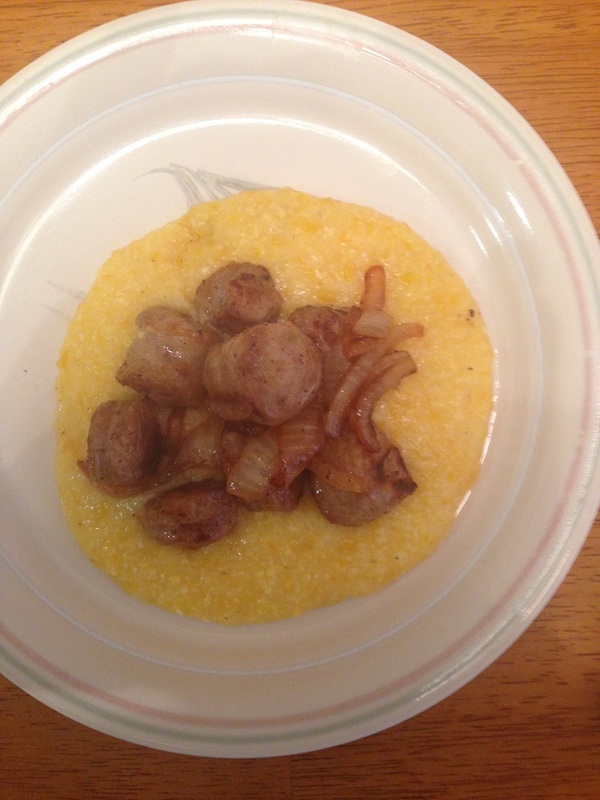 Spoon the polenta into bowls and top it with the sausage and onion and garnish with the rosemary sprigs if you like. It’s a very simple meal that packs some great flavor and is very satisfying. I love the way the squash and the polenta worked together here and it gave the polenta great texture and color. The sausages went really well with the polenta and the whole meal only takes about 30 minutes to cook. If you have polenta left, it sets really nicely when it is chilled and you can cut it into squares and saute it up as a side dish for all kinds of meals if you like. This is a great easy meal for a busy weeknight when you want something quick to put together and I think it would work well with just about any type of fall squash that you might want to use.